I posted this bed yesterday over at Simple Dwellings and it got me thinking...can I make this bed? I've already made a simple upholsterd headboard, so what if I challenge myself. I'm off to check Craigslist. Sure you can! Can't wait to see what you find on Craigslist. If you find the right piece I really do think it is possible. You know what's funny, I posted that image months ago but have gotten a lot of emails about it recently. I think it's because I -Village posted a similar bed. 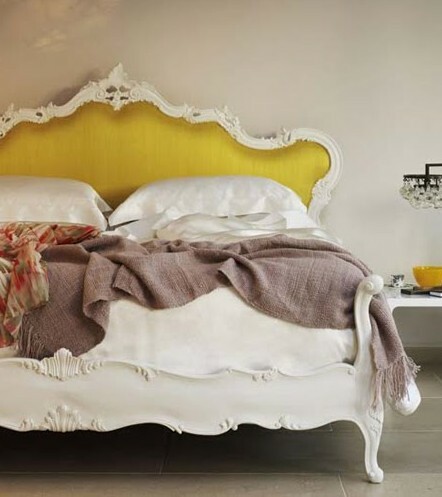 Gorgeous bed, love the yellow. I used to think it was vintage, but those two sure look the same, don't they? Can't wait to see what you come up with. It is a gorgeuos bed. Maybe check for sofa's too. You might be able to take the back off of a sofa with a similar shape to create your headboard. Just sayin.